It is the most used and tested portable filter straw. Great for camping, boating, travel, hotels/motels, and emergencies. Fits in your shirt pocket, glove compartment, purse, first aid kit, knapsack. A must for emergency preparedness. 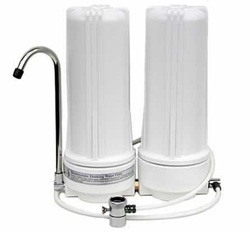 Each replacable filter will provide 25 gallons of drinkable water. Be safe, be sure what your drinking. Bacteria and/or viruses can ruin your vacation or outing. It comes with a waterproof caring case made with non-toxic BPA free materials tested by independent laboratories. Compare to the newer highly advertised "Life Straw"
The Life Straw does not remove dangerous Viruses. While it advertises to filter 1000 gallons of water, would you really want to be on your knees sucking up 1000 gallons of water? For more extended filtration needs, you switch to the pump shown below. It also removes 99.9999% of Bacteria and Viruses. Both should be in everyone's Preparedness Package. Provides up to 100 gallons of filtered water. It breaks down into two separate easy-to-carry components that fit into any backpack. The pumping system is powerful - delivering 60 PSI at point of contact. Now with BIOSAFE®, removes up to 99.9999% of bacteria, virus, contaminants and pollutants found in fresh water supplies including Aesthetics such as chlorine, Sediment and dirt; Biologicals such as Giardia, Cryptosporidium, E-Coli Bacteria; Chemicals (VOC'S) such as DDT, MTBE, Benzene, Chloroforms (THM'S); and Dissolved Solids (Heavy metals) such as Arsenic, Lead, Mercury, Copper, Zinc, Aluminum and Chromium proven effective in the removal of bacteria and virus to six logs (99.9999%). A necessary item for any survival storage program. Can provide enough purified water for groups of people. Light weight and portable – A must for camping, rec. vehicles, travel, any outdoor situation as well as for everyday use filtering chlorine, bad tastes from tap water. World's first stainless steel water filtration bottle. Great anywhere, anytime you are thirsty for great-tasting, fresh water. Enjoy filtered tap water on the go instantly filtered as you drink! Exclusive filter removes up to 99.99% of pollutants for up to 100 gallons of great tasting filtered water and saves over $700.00 of bottled water costs the equivalent of 757 half liters of bottled water! Use them daily at home and the office filtering your tap water to save money and feel good that you’re not contributing to the millions of pounds of plastics polluting our planet! Attaches to a belt or backpack, are great for any use: walking, hiking, biking, travel, hotels, motels, camping, boating or emergency preparedness! · Aesthetics: unpleasant taste, odor, clarity, chlorine, dirt, sediment and Chlorine. · Chemicals: toxic chemicals, detergents, pesticides and other harmful industrial and agricultural wastes. · Dissolved Solids: heavy metals such as aluminum, asbestos, copper, lead, mercury, chromium 6 and others. · High-quality food grade 304 L.N. stainless steel. Durable, lightweight, reusable and 100% recyclable. · BPA-free; non-leaching & lead-free. · No inner lining; clean tasting. This BPA FREE squeeze bottle filters 99.9 % of chemicals, heavy metals, and radon 222. Gets about 40 gallons of pure water before changing filters. That's approximately 300 refills if you're paying $.50 for a small plastic bottle of water. 300 refills saves you $150.00 without the PBA. Each replaceable filter gets about 40 gallons before it need to be changed. Intended for municipal water only. Great to take on hikes, trips or bicycling, or just around town instead of buying bottled water. Your on the road, you need a drink of fresh clean water, but you're a bit leery of whats coming out of your faucet and shower. You remembered our slogan, "If you don't have a Filtercon, you may be the filter." So you called our toll free line (800) 550-1995 and selected on of our Whole RV filters and now your one of the Filter Family Members and good to go. It gets up to 12,000 gallons with this 1 Stage RV Filter. with this 2 Stage RV Filter. In addition to providing great tasting Filtercon Fresh Water, our deluxe model will give you better soap suds naturally. You will feel a difference in your water. It also helps to reduce spotting. Up to 20,000 gallons with this 2 Stage RV Filter. of your faucets, shower heads, and appliances in your RV. When taking water from unreliable water sources, particularly when traveling in foreign countries, bacteria and virus protection is necessary! Exposure to pathogenic organisms can result in severe illness and of course ruin your vacation trip. There are two types of ultra violet disinfection units. Central, which treats all the water in the RV or point of use under the sink to treat just one faucet. Bare in mind, exposing ones self to contaminated shower water can result in the ingestion of pathogens also. 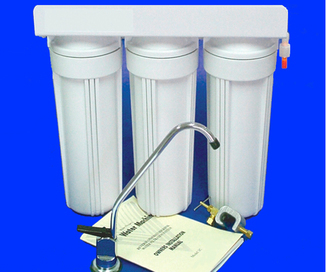 Point of use units can be added to any of our reverse osmosis or under sink filtration units, or be installed by them selves. provides great quality and tasting water. Comes with its own faucet and color coded tubing for easy installation and a filter wrench. Polypropylene 5 MICRON filter for removal of sand, silt, dirt, and rust particles. - Carbon filters are effective at removing chlorine, sediment, and volatile organic compounds (VOCs) from water. This Filter connects directly to your kitchen faucet. It also has a button on the unit to switch from filtered water to tap water. You deserve healthier water in every aspect of your daily life, not just your drinking water. This specially designed; dechlorinating shower system provides a long lasting solution to problems associated with chlorine exposure. Specially formulated KDF media effectively converts chlorine (90%) into an environmentally safe and harmless zinc chloride. Enjoy healthier, younger-looking skin, softer, more manageable hair (and less fading of color treated hair), relief from dry skin and scalp. Enjoy your shower! The CQ-1000 is the only filter to include Crystalline Quartz technology in its media for an energized shower experience. These specially cured crystals act upon the water to create a softer, more energized “feel” and improve both lathering and suds. Unlike other dechlorinating shower filters, CQ-1000 is specifically engineered for efficiency and performance. Its unique filter design provides the best shower experience available. Just drop the ball in the bath or Jacuzzi, wait a few minutes, and enjoy chlorine-free water! The Crystal Ball for the Bath is attractive and provides chlorine-free filtered bath water that is safe for babies and tender skin. It prevents dry skin by dechlorinating the water in just minutes. Chlorine-free water restores a healthier, younger-looking skin. Replacement bags are available for the Crystal Ball. Crystal Ball lasts 300 baths. Replacement filters available upon request.